How does light mover hydroponic lighting work for an indoor grow setup? And, what are the general advantages to having some version of a hydro grow kit? First, growing indoors hydroponically can give us four times the crops in the same space compared to soil growing. That’s significant for our indoor grow room setup. A hydro grow is efficient that way. And, we can save up to 90% in water and in space compared to outside growing. This is especially true of vertical grow setups and vertical growing systems such as Bright Agrotech’s Zipfarm. These are brilliant indoor grow systems. And, their focus is in maximizing results in a much smaller, more efficient area. In addition, light mover hydroponic lighting makes the indoor hydro grow even more efficient. Here is how that works. Light mover hydroponic lighting provides another level of efficiency. Specifically, we are now able to cover 30% more area per indoor grow light. That detail enables massive savings in upfront grow equipment costs. And, it’s a huge savings in growing equipment maintenance costs. That’s because we have a smaller number of grow light systems to maintain. Plus, we have fewer replacement costs including the costs of grow lamp and ballast replacement, again because we have a smaller number of them. Of course, that 30% number depends on many variables including the number of stationary lights being used as a benchmark. 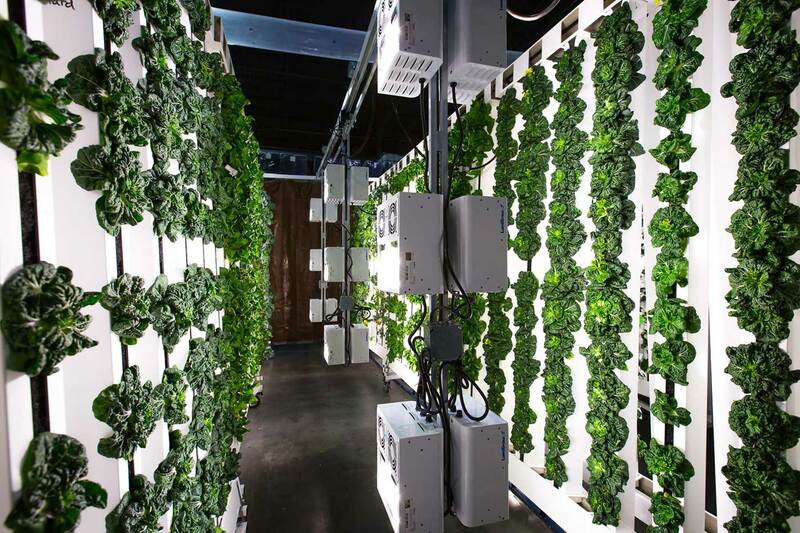 The next to mention for the light mover hydroponic lighting efficiency is the cost of electricity. So, this falls under the category of the indoor grow room monthly expenses. And specifically, this deals with the grow light mover reducing electrical usage by 30%. In other words, when each indoor grow light covers 30% more area, we can use 30% fewer indoor grow lights. Then, we have 30% fewer grow lamps being used along with 30% less heat thrown off from those grow lamps. So, that is an a/c consideration. In a time when being cost-effective is more important than ever, this is a significant savings. As to the actual electrical cost of running a LightRail light mover, we have this. The LightRail 3.5 Kit, as an example, runs on about 5 watts and the LightRail 4.0 Kit runs on about 9 watts. So, they are similar to a nightlight and yet they save us so much. And, that savings is for both setup costs with fewer grow light systems needed and in the operating costs of our grow room setup. That’s including the cost of electricity. Equally important is the efficiency of the outcome. How does using a grow light mover effect growth rates and yield numbers? Growth rates are much faster and yield numbers increase significantly. Plus, that’s with covering more area. But, if a grow room design is limited in space; the grow light system may also be limited. Yet, in those instances of keeping the grow light system coverage area the same, stationary light to moving light, we see this from our grow light system. Our yields are even higher. So, with a greenhouse tent or indoor grow tents, even with limited space, we have these details. We don’t want the burn of a stationary grow light beating down in one spot. So, with moving our indoor grow light just a little bit, we get incredible results when it comes to yield. The greenhouse tent or indoor grow tents give us those results we want when we move our grow light systems. And, that’s because we have gotten rid of the hot spot. Plus, we are getting a better indoor plant light to more of the leaves. On that subject of stationary indoor grow lights and hot spots; grow light movers allow us to do this. When we move our indoor grow lights along a light mover rail, we can now get our grow light system closer. And, that’s without the hot spots. And, for the greenhouse tent or indoor grow tents with stationary grow lamps, that hot spot is absolutely there in that confined space. That’s unless we move our grow light system. But, in a larger space and getting our grow lamps closer on grow light movers we are doing this. Our closer indoor grow lights are now an example of Inverse Square Law working for us. Inverse Square Law states that the farther away a grow light system is positioned, the weaker it is. And, it’s geometrically weaker. So, at five feet above the canopy, we are at 50% grow light system strength. That’s extremely inefficient, and it undermines our efforts. But, when our indoor grow light moves, the hot spot is no longer an issue so we can get our grow light system closer for maximum PAR right to the canopy. That gives our plants the best quality indoor plant light. And, that explains part of the much-improved growth rates and yield numbers. But, there is another side to the benefits of our light mover. And, this effect happens at the same time as the closer, more powerful grow lamp interaction. The light mover hydroponic lighting also affects the quality of indoor plant light on each leaf surface. In other words, we get better penetration to more of the leaves. And, that better coverage is at just the correct amount of time per leaf surface. This is called Leaf Area Index (LAI) and it makes all the difference for results. Intense grow light system interaction that moves off slightly and then is back is just what leaves can handle. It is another efficiency move. And, this time it is delivering to each leaf surface just the right type of indoor plant light. In other words, it’s a grow light system interaction at the best rate and level. Light mover hydroponic lighting is efficient on all levels starting with the basics of less space and water needed in the indoor grow room setup. And from that point, we are efficiently covering 30% more space per grow light system. That detail alone is a huge savings in upfront costs and in operating costs. Beyond that, we are making our indoor grow lights more powerful by getting them closer for higher received PAR. And, we reach more leaves at just the perfect time for each leaf surface area. Hydroponics with the indoor grow lights moving on light movers is the ultimate combination for efficiency and yield results.